In 2011 Manal al-Sharif was imprisoned for driving in Saudia Arabia. She slept on a filthy mattress in a cockroach infested jail crowded with too many women. If her travel, intelligence and determination had already set her on a path to be somewhat of a women’s activist, this was the straw that broke the camels back. Meeting these imprisoned women only strengthened Manal’s resolve that things in Saudi Arabia needed to change. This beautifully written memoir describes her childhood, faith in her religion and her family. Rules and customs were not to be analyzed and debated, they were meant to be accepted. But a simple act of driving could change women’s lives. Manal felt this one non violent act could express years of struggle and hypocrisy. Women can go to school but they cannot get there? Women cannot get to or from a hospital, even in a emergency without a male to drive them? An Uber driver, virtual stranger, is better/safer than a female friend, relative or themselves? Manal, a highly educated and trained computer scientist took one brave step at a time; to get to college, be the best and secure a top job in her field only to realize she will never be free in the country she loves with all her heart. In this passionate memoir she details her journey to adulthood with a calm and beautiful voice. I was mesmerized right from the beginning, first with compassion and then with frustration and anger. As I began to imagine the struggle of these women, I thought what can I do? Well, living in the capitalist world I live in, I can affect from the pocket. I will no longer buy Starbucks or take Uber. These American companies should not condone/support/profit from separate but equal anywhere in the world. Equal is equal. As Manal says in her memoir, the rain starts with one drop. 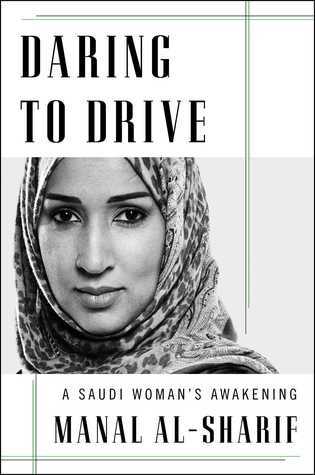 I highly recommend reading Daring to Drive. As we navigate our own daily challenges, conscious of our good fortune, we must continue to move forward in all the world to be good humans.